To welcome you on board NordicBet Casino is giving you 50 free spins on the ever-popular Starburst (no deposit required). And to get you on your way they will also give you a 200% bonus on your first deposit, up to €200! Open an account with NordicBet casino where you can find a wide selection of fun and easy to play casino games from the old classics to the latest releases. Make a deposit, enter the bonus code NB200 in the “Bonus Code Box“ and we will give you you your 200% bonus, up to €200. So if you deposit €100, NordicBet will give you the maximum €200. Start playing NordicBet casino and remember that you have 50 free spins on the Starburst casino game to use as their way of welcoming you (NO DEPOSIT REQUIRED). Open an account with NordicBet casino !! The 50 free spins are available exclusively on video slot Starburst in the NordicBet Casino. The 50 Free Spins will be added to customers' accounts instantly after registering an account. Existing funds on customer’s account will be used before any winnings from the 50 Free Spins can be used. Any winnings must be wagered 35 times before the bonus and/or winnings can be taken out of the Casino. This offer is only valid for customers residing in the following countries: Norway, Finland, Denmark, Sweden, Faro Island, Iceland, New Zealand and Australia. The Bonus Code NB200 must be used to receive the Welcome Bonus. To receive the bonus, you may not have played in the casino for real money before. Welcome bonus must be wagered 35 times before withdrawal can be requested on deposit, bonus funds and/or winnings. 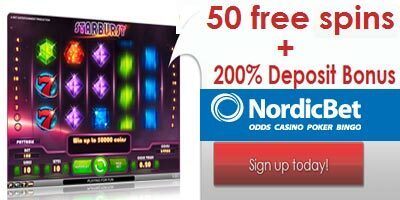 "NordicBet Casino: 50 free spins (no deposit required) + 200% Deposit Bonus"